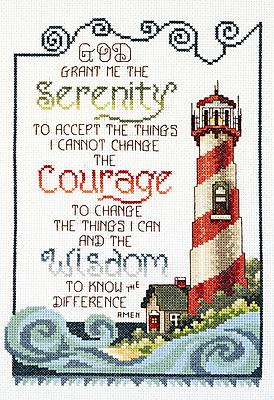 Serenity Lighthouse, This insperational saying makes a wonderful counted cross stitch wall hanging for anyone. Serenity, courage, wisdom are insperation at its best. This counted cross stitch kit contains: 14 count Aida, 6-strand cotton floss, needle, gragh & easy to follow instructions. Design size 7.25" x 10.25".